I saw this drink a few weeks ago one of my favorite link sites, 'A Welsh View' and at first I thought it was a joke. But I was in Kaibara on Tuesday and the drinks case at Lawson was full of 'em so I decided to take the plunge. Let me tell you, it was pretty frickin' weird, but good; sort of a sweet, fizzy, salad-y kind of a taste. As advertised it really IS Pepsi + Cucumber, the taste of which really needs to be experienced to be understood, but let me quote the bottle to you anyway. Cucumber' is the English word for 'kyuuri'. 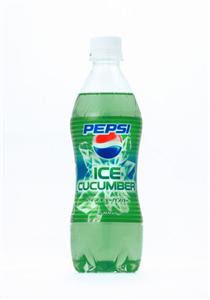 Cola and Cucumber: A suprising combination makes for a refreshing cola!